The backyard with a lovely garden, a swingset and a hammock. Children's bedroom. It includes a darling daybed for a child. Joshua's Pond, a quiet, 5-minute walk up the street. Dowses Beach, 3 mins. by car with private parking. 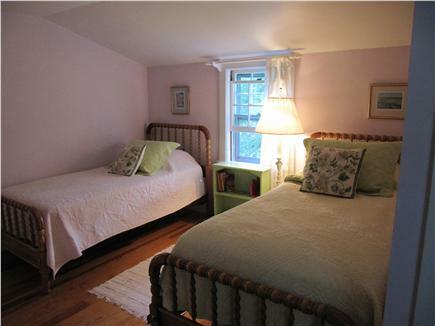 Elf Hill Cottage is comprised of two double bedrooms, a third bedroom with two twin beds and a daybed for a child, two full bathrooms, a living room, dining room and sunroom. There is an automatic garage. The house has been freshly painted, has hardwood floors upstairs and down, and is charmingly furnished. A particularly wonderful aspect of the house is its spacious English-style garden. It is fenced-in for the peace of mind of parents of toddlers, and has a large, Cape-y outdoor shower. The hammock is the perfect spot for an afternoon nap or for reading whilst watching over children playing in the yard. The east-facing patio is a lovely spot for breakfast. Elf Hill Cottage is in a quiet residential neighborhood, yet Main Street, with its small collection of wonderful restaurants, art galleries and tasteful clothing and gift shops, is a five-minute walk away. 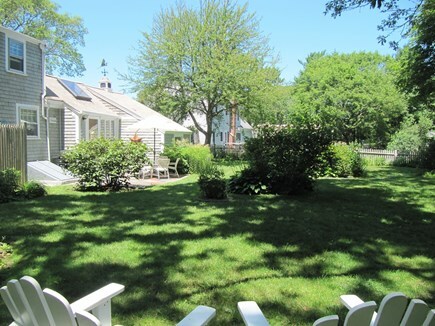 A central, village location in Osterville is highly valued as most homes require a car for getting about. At Elf Hill, you could find yourself going for days without getting behind the steering wheel. The village of Osterville is located on the south-central coast of Cape Cod on Nantucket Sound. 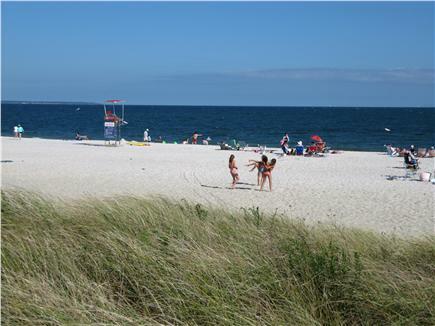 It is considered to be one of the most beautiful and desirable villages on the Cape, and is prized for its quaint Main Street, its beautiful New England architecture, and its picturesque, warm-water beaches and harbor. Outdoor enthusiasts will enjoy walking, running, biking, golfing, fishing, crabbing, oystering, kayaking, whale-watching and boating throughout the area, and there are myriad activities for children. Boston is about an hour and twenty minutes’ drive, and Hyannis, with its airport and ferries to Martha's Vineyard and Nantucket, is ten minutes away. 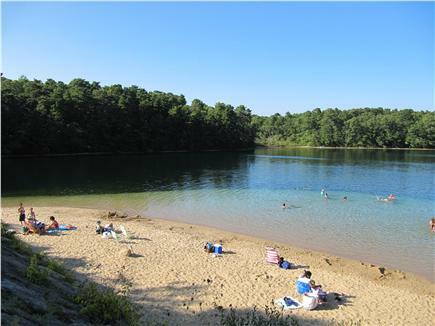 A beach pass allowing free access/parking to all the beaches in the seven villages of Barnstable (Osterville, Hyannis, Cotuit, Centerville, Marstons Mills, Barnstable and West Barnstable Villages) is included in the rental. We offer good wifi, cable TV and beach paraphernalia (chairs, boogie boards, umbrellas, toys, etc.). Sheets, bath towels and beach towels are included. You will find in the sunroom a constantly updated booklet with much advice and tips regarding the Osterville area and farther afield, where to shop, family activities (such as whale watches, the Cape summer baseball league, the best miniature golf...), favorite restaurants, and descriptions of the nearby beaches as well as those involving a day trip. Do peruse our many five-star reviews! Long-Term Rental (1 month or more): Available for a month or more between October and May at a substantially reduced rate, plus utilities. The final price depends on the number of people in the party, the duration, etc. Additional pricing info: $180 cleaning charge; $500 security deposit. Beach pass, linens, towels and beach towels included. State and local taxes of 14.45% will apply. There is a queen bedroom and a full bath with a shower on the ground floor. We are a Franco-American family of three: Liz, Eric and 15-year-old Alexander. I grew up on the North Shore in Massachusetts but have lots of family in Osterville. 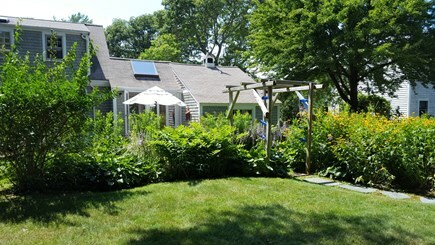 When we were looking to buy a vacation home on Cape Cod, we visited dozens of homes all throughout the penninsula. We slowly came to the realization that Osterville was really the ''best'' village, and were were lucky enough to find our dream house here. We have a network of trusted professionals who look after Elf Hill beautifully in our absence (great cleaning team, gardener, caretaker, etc.). We have been renting the house out to terrific people from all over -- mostly Americans, but also Canadians, Brits and the French -- since our purchase. The experience has been extremely satisfying and positive.